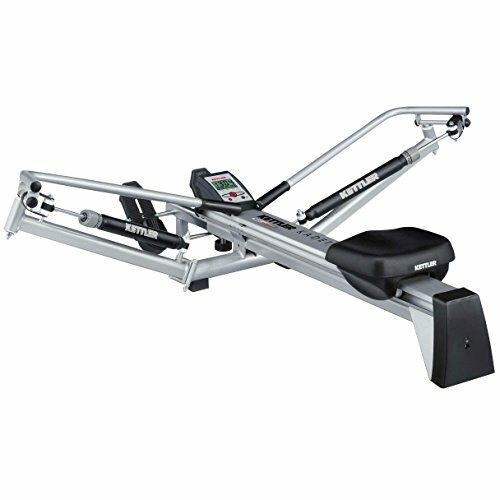 The Kettler Home Exercise/Fitness Equipment: Kadett Outrigger Style Rower Rowing Machine is an excellent option for improving one’s muscular and cardiovascular health. The high resolution LCD digital display is easy to read and provides the following workout data: Time, Distance, Energy Consumed, Strokes, Pulse Rate and Frequency. Two industrial strength hydraulic pistons provide resistance with adjustment knobs to vary the resistance level. An infrared earlobe clip sensor is included that can easily measure your heart rate. The level of resistance can be changed by using adjustment knobs to change between settings 1 to 12, this provides a large range of resistance to accommodate workouts of varying intensity. The biomechanically correct footplates offer a natural pivoting action, providing a full longitudinal rowing motion. The frame of the machine is made of high carbon steel and powder coated, the frame has a lifetime warranty against breakage. The seat is thickly padded to provide maximum comfort and combines with top grade rollers to yield exceptionally smooth performance along the chrome plated steel rails. The Kettler Home Exercise/Fitness Equipment: Kadett Outrigger Style Rower Rowing Machine does not require any AC power source, however, the LCD display operates through two "AA" batteries.